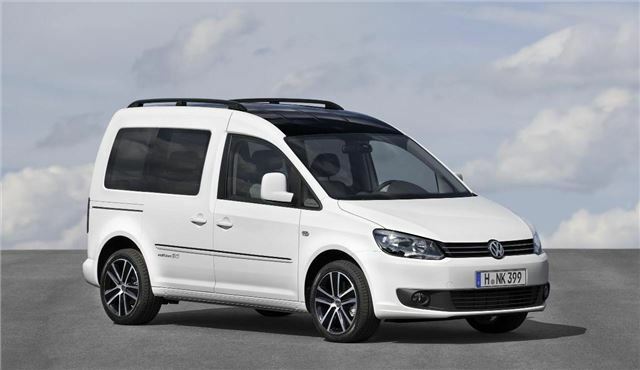 The original Volkswagen Caddy, which was a Golf based pick-up truck, was launched 30 years ago, and to celebrate its birthday Volkswagen has introduced a special edition version of the current Caddy called the Caddy Edition 30, which is currently in a pre-production stage. The current generation Caddy isn’t available as a pick-up, but it comes in numerous forms, from panel van to family car. The Edition 30 comes in five- or seven-seat configurations and has a selection of high end features. The roof is painted gloss black, and the 17-inch wheels gleam thanks to generous polishing. More impressive is the interior, which is trimmed in exotic Alcantara and features a multi-function steering wheel. ‘Edition 30’ badging completes the unique touches. The Edition 30 is available in five colours, with diesel or petrol engines. An example of the Caddy Edition 30 is on display at the Frankfurt Motor Show.